The retailer's continuing to deliver good profits on falling sales. When will it end? 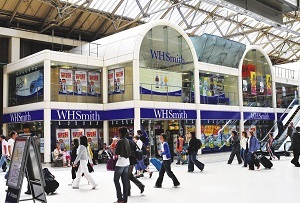 The trading updates of WH Smith are always an interesting read - seldom does a business come across as so content with an ongoing decline in turnover. Where other chief executives would be rushing around, trying to come up with something to placate shareholders, Stephen Clarke comes across as cool as a cucumber. That's because Smith's has turned cost-cutting into an art form – last year it reported 9% profits growth despite a 2% fall in sales. As consumers turn away from the high street, stop buying physical books and turn their nose up at till-side offers of massive chocolate bars, Smith's has managed to survive by working on its margins. Today it announced that like-for-like sales in the 20 weeks to January 17th were again down 2% (1% including new stores), but insisted that this was 'in line with plan' as profits continued to grow. Sales figures could have been much worse if it wasn't for the chain's 'travel' stores (the kind in train stations where you pay an arm and a leg for a bottle of Coke), where sales were up 7%. Investors certainly weren't impressed this morning – shares were down 0.89% to 1,334p. Shares are still way up on where they were a few years ago though, as investors have been happy to keep on taking solid dividends. Things will have to come to a head at some point though. Profit growth against falling sales is all well and good, but you can only cut costs so far, and some stores already feel like a bit of a ghost town, populated primarily by automated checkouts and questionable carpets. Only time will tell whether Smith's can actually be turned around.